The “mother tone” in the resident’s voice stops co-worker Maureen Sirianni cold in her tracks. The woman, who does not speak due to advanced dementia, is having a loving discussion with three stuffed bears. As she listens, Sirianni, Connections memory support manager at Country Meadows of South Hills near Pittsburgh, realizes the resident is talking to her three children to resolve a family situation. For a moment, the mother, who is typically locked deep within symptoms of Alzheimer’s disease, emerges and finds her voice. A group of residents participate in Fine Art Miracle using tactile materials an interacting with co-workers. The moment occurred during a pilot series of multi-sensory sessions for residents with Alzheimer’s disease and advanced dementia held at Country Meadows. Laughter, conversations, increased alertness, relaxation, stronger gait, recognition of the instructor, and easier transitions to the next activity were among other promising results observed. The pilot program is provided by Fine Art Miracles, Inc. (FAM), supported by grants from the Jewish Health Care Foundation and the Buhl Foundation. Tess Lojacono, CEO of FAM, credits Sirianni with helping her rethink programming for memory care residents and providing an opportunity test the result. “Maureen is one of those people who doesn’t say ‘no,’ she says ‘how can we make it work better,'” says Lojacono. After noticing that memory care residents didn’t respond to traditional art therapy sessions for seniors, Lojacono spoke to Sirianni about her desire to create a more beneficial program. Rather than try to draw them into her world, she wanted to put the focus on entering their world through multi-sensory engagement. Through research and observation, Lojacono found a variety of tools to test, and Sirianni invited her to bring them to Country Meadows. As they met, two memory care residents came into the room and took interest in the items on the table. For the weekly pilot sessions, Sirianni selected residents who are far along in the global deterioration scale—a measure used to assess the progression of dementia. She and Lojacono experimented with everything from the time of day the program was offered, to the size of the room. 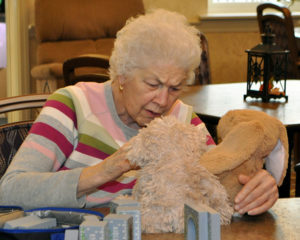 During the Fine Art Miracle program, a resident who doesn’t speak due to dementia finds her voice interacting with stuffed animals. There were other surprises, too. At the beginning the ladies guessed 30 minutes would be a good length of time for the multi-sensory experience, but by the end of the pilot testing, most sessions lasted a full 90 minutes. Sirianni also was surprised by the success of “Romibo,” a social robot. At about one-foot tall, covered with fur and a pair of expressive eyes that blink, Romibo moves around the table to ask questions and interact with residents to stimulate conversation. To Sirianni’s surprise, residents readily touched and engaged with Romibo. Other sensory stimulants used in the sessions include aromas, music and a sensory covering, which is a specially designed blanket that has a variety of textures, colors, appliques of pictures, and pockets that can hold items. The use of these four types of sensory engagement enables residents to participate in any way they can without expectations or judgement. The sessions, which are designed for up to six participants, incorporate all of the sensory stimulants around a central theme. For a cooking-themed experience, the room might smell like baking apples and blanket pockets might include an egg beater, whisk or plastic cookie cutters. The blanket might also have pictures of cookies, pies or a rolling pin. It is placed on the table and then rotated several times throughout the session to give everyone an opportunity to explore different parts. In the meantime, Romibo makes his rounds to ask each resident questions about cooking and his/her experiences. Lojacono recalls a resident picked up a hand mixer and began cranking it to show Romibo how it worked. At the beginning of another session a resident asked, “Did you bring me something good to smell?” indicating that he remembered the instructor from a previous session. In general, faces relaxed, shoulders went down and everyone enjoyed themselves. One resident who frequently cries, stopped crying during the sessions. Another who frequently wanders away from activities, stayed at the table because he was so engaged. “The fact that this is a place where they cannot make a mistake makes it very relaxing. It reduces their stress because they don’t have to worry that they may do or say something wrong,” says Lojacono. As the weeks went on with apparent success, family members were interested in observing the sessions. Sirianni says that, at first, family members watched from a distance. However, after just a few sessions, family members were right next to their loved one, asking questions just like the instructor. Sirianni and Lojacono presented findings at a recent Alzheimer’s Association conference and Lojacono now offers the multi-sensory sessions as a regular part of her FAM programming.